It's raining surprises from Sundar C's camp! First, it was the announcement of Kalakalappu 2 and now more news coming in from there. Today, Kalakalappu 2's shoot began with Mirchi Shiva gracing the sets and now, Sundar C's wife Khushboo has taken to her Twitter page to give us an exciting update on Sangamithra. 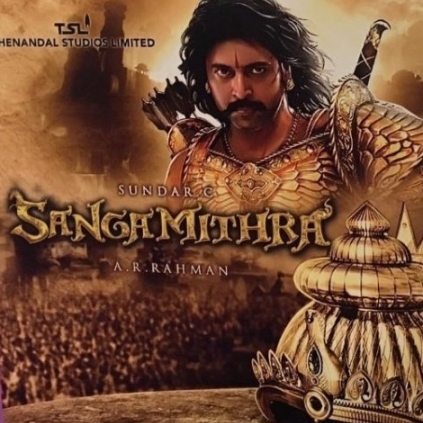 Sangamithra began a few months ago with a grand launch at the Cannes Film Festival with AR Rahman, producers Thenandal Studios Limited and its premier cast present. But later, due to various issues, the film's commencement got pushed and Sundar C even announced that Kalakalappu 2 will be made as a quickie film before beginning Sangamithra. Just as we thought Sangamithra will take a lot of time to start, Khushboo tweeted, "#SANGAMITRA is getting ready..set work is underway..shoot will start as soon as it's ready .so double dhamaka. @ThenandalFilms @aditi1231 ❤". It is already said that Kalakalappu 2 will be completed really quickly by December to prepare for a Pongal release, and now with this update, we can almost be rest assured that Sangamithra will be preparing to go on floors very soon. Director Sundar.C has officially started his next film Kalakalappu 2 today (4th October), with his team at Karaikkudi. The shoot has been started off with Mirchi Shiva, Robo Shankar, Vaiyapuri, Manobala, Santhanabharathi, and others. Khushbu Sundar took to Twitter to confirm this news with her tweet, "#Sundar.C's #Kalakalappu2 rolls 2day..a fun filled paisa vasool rollercoster entertainer wl b ready 4 early 2018.."
This will be Vaiyapuri's first outing after Bigg Boss, who must be excited to get back to his routine cinema life. Kalakalappu 2 has Jiiva, Jai, Mirchi Shiva, Catherine Tresa and Nikki Galrani in the lead roles. People looking for online information on Khushboo, Sangamithra, Sundar C will find this news story useful.